Japanese Episode AG 178: "Takeshi & Satoshi! Protect the Nibi Gym in a Tag Battle!!" American Episode 448: "Grating Spaces!" Takeshi and his friends have arrived in Nibi City! However, when they arrive, they see that the Nibi Gym has been completely remodeled! A quick talk with Takeshi's siblings reveal that their parents hired a trio of interior decorators to renovate the gym while they go on a second honeymoon. Takeshi, understandably, is upset. Eventually, the three renovators, who turn out to be the Rocket-Dan in disguise, arrive at Takeshi's house to challenge him to a tag battle. 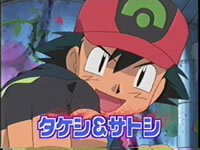 Takeshi accepts and takes up Satoshi's offer to battle alongside him. The Nibi Gym team consists of Satoshi's Donphan and Takeshi's newly-evolved Haganeil while the renovator team consists of a Lizardon and a Bossgodora that the Rocket-Dan had received from Delibird earlier in the day. The battle starts, and for a while, the Lizardon and Bossgodora team have the upper hand due to them having attacks that are super effective against the Nibi Gym side's pokemon. As the battle continues, Masato spots Nyasu attempting to steal the gym's pokemon and exposes the Rocket-Dan for who they are. Angered by the deception, Takeshi and his brother, Jiroh, attack the trio with all their pokemon at once. The Rocket-Dan are sent blasting off, ensuring the gym's safety from any further remodeling. Later, Takeshi's parents return and apologize for leaving the gym's fate up to a bunch of strangers. After Takeshi accepts their apology, Satoshi-tachi return on the trail to the Battle Pyramid. After the previous episode, you don't really expect to have another A+ episode follow it. Yet that's exactly what happens here. This episode is great for so many reasons. For one thing, the kids who have been traveling around Kanto for the past year or so have finally visited a location in Kanto. The last time they did that was...Haruka's first Kanto Pokemon Contest? Way the hell back then? Wow. The other stuff in the Gym was great as well. Seeing Takeshi's siblings is always nice, and the fact that Jiroh was able to make Takeshi's Iwaku evolve into a Haganeil was a nice surprise. This episode also gets huge points for me for including Delibird, a plot point that hasn't been visited since Jouto. Though it is kind of amusing how the Rocket-Dan don't make any mention of the fact that they haven't seen the pokemon in like four years. If I was in their shoes, I'd seriously at least have a shocked reaction or something. Another comment I have about this episode is that the Japanese version is still feeling the effects of 4Kids' reign on the show. The producers of this episode go to ridiculous lengths to cover up the NIBI GYM sign on the outside of the gym so that the dubbers wouldn't have to spend any time and money on paint edits. I mean, the gym spends most of the episode being splattered in paint from the renovators, but even when it's restored to normal, the only shot of the gym we see is of the left corner of the building. As in, the corner that doesn't have any text on it. I really wish the Japanese version wouldn't compromise themselves by continuing to do all this crap for the dub's sake, but I honestly don't see them changing this behavior any time soon. The only other thing I would fault this episode with is the fact that it's pretty much just a rehash of that Housoukyoku episode. I mean, there are differences to be sure, but the episode still has that "been there, done that" feel to it. The dubbed version is nice because they don't completely rewrite Jiroh's character the way 4Kids did. If you remember, Forrest was pretty much Brock 2.0 in that one Chronicles episode, but luckily PUSA chose to ignore that and went for a straight translation instead. It's also pretty impressive that they used the names heard in "Showdown in Pewter City." Nice to see Pokémon USA doing their homework. The only complaint I have about the dub (other than the music) is Flint's voice. Yeesh. Haganeil, Crobat, Delibird, and Lizardon keep their Japanese voices. The song that will never die, Pokémon Symphonic Medley, is used as an insert song in the Japanese version of this episode. This time, it plays from the moment Jiroh orders the gym pokemon to attack the newly-exposed Rocket-Dan until after they blast off and we see all those close-ups. The dub, of course, replaces this song. Meowth: "What do you mean it was a mistake and they were meant for Butch and Cassidy?" Originally, he says "Kosanji," the English equivalent of which would be "Botch."